Aside from the oddity that the numbers are being released on a Thursday, what should we be looking for tomorrow? Last month, as predicted, much was made of the fact that we now have more total jobs (public and private combined) than we did before the Great Recession began in December 2007 (of course, due to the growth of the potential labor force since that time, we are still millions of jobs in the hole). The data being released tomorrow are for June 2014, which marks the five-year anniversary of the official end of the recession (and start of the recovery) in June 2009. One thing that has been historically unique about this recovery is the unprecedented loss of public sector jobs. The private sector began adding jobs in the spring of 2010, but the public sector continued shedding jobs until last summer. 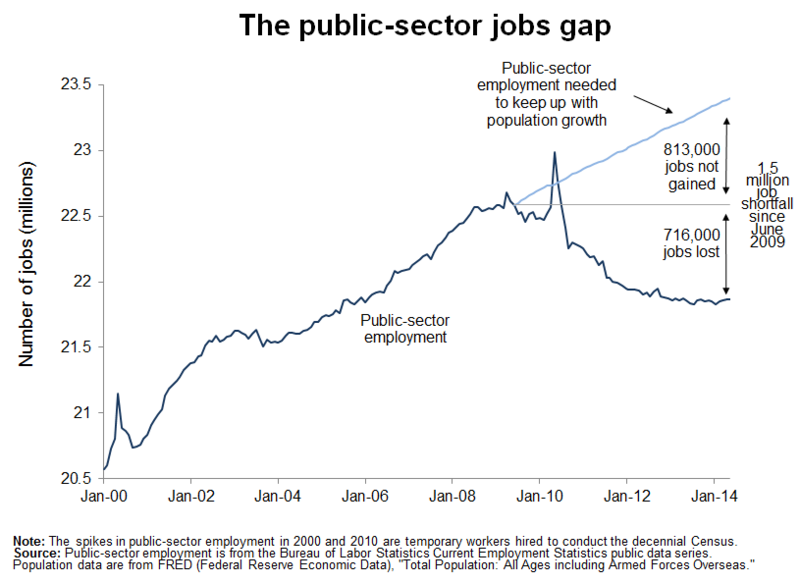 The figure below shows the public sector jobs gap. We are currently 716,000 public sector jobs below where we were when the recovery started, but to keep up with population growth since then, we should have added over 800,000 jobs, so we are around 1.5 million public sector jobs down. About a third of them are teachers and other employees in public K-12 education. The total number of public sector jobs hit its low of the recovery last July, so we are no longer shedding public sector jobs. However, we have also not started filling in the gap, as public sector jobs have been roughly flat since last summer. The loss of public sector jobs has been an enormous drag on our recovery that was not a factor in earlier recoveries.